The Village of Millbrook will be flushing fire hydrants throughout the Village during the week of April 22nd. Flushing is essential for pipe maintenance. It is common to experience turbidity (cloudy water) following the procedure. Run your faucets for a few moments to clear silt from your lines and check your washing machine and shower before using. Any questions please call the system operators VRI Environmental Services, Inc at 845-677-3839. The Town of Washington and the Village of Millbrook, along with members of the Millbrook Rescue Squad, will be holding an Informational Meeting regarding Rescue Squad services in our community. The meeting will be held on Monday, April 8, 2019, 7:00 PM, at the Millbrook Fire House. address any questions the public may have on the Thorne Building. Any and all interested parties are welcome to attend. By order of the Village of Millbrook Board of Trustees. 2002 Chevy 3500 Diesel Dump Truck, 4-wheel drive, complete with 9 ft Western Pro Plus plow and leaf box. 66,066 miles. Being sold AS IS. Bids will be accepted until February 5, 2019 to be opened February 7, 2019 at 12:00 PM. 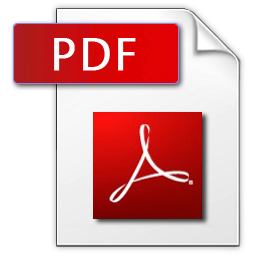 Notice is hereby given that the fiscal affairs of the Village of Millbrook for the period beginning on June 1, 2016 and ending on March 28, 2018 have been examined by the Office of the State Comptroller and that the report of examination prepared by the office of the State Comptroller has been filed in the office where it is available as a public record for inspection by all interested persons. Village of Millbrook Awarded $1,140,000.00 for the upgrade of Public Water Supply - through the NYS Water Infrastructure Improvement Act; total project cost $1.9M. The project will provide a water filtration process to the water supply and insure high quality potable water to the residents of the Village of Millbrook and the Town of Washington for many years to come. The project also includes the rehabilitation of the water storage tank which was built in 1933. On Monday, November 12th & Tuesday, November 13th CHURCH STREET will be CLOSED TO THRU TRAFFIC between MANZI DRIVE & MANOR DRIVE. Due to an emergency culvert repair. Please use alternate route. On Tuesday, October 23rd and Wednesday, October 24th VRI will be replacing 2 fire hydrants on Reservoir Drive. A rain date is scheduled for Thursday, October 25th. The work is planned to be done between 9:00 am and 4:00 pm. In order to accomplish this work safely the water will need to be shut down for a period of time. The water shut down will be minimized as much as possible. After the work is completed the water may be dirty for a short period. We apologize for any inconvenience. If have any questions or concerns please call VRI at 845-677-3839. Board of Trustees, Kyle Van De Water (REP) and Tim Collopy (Dem) will participate in the debate. Candidates Cathy Doro (Rep) and Kevin McGrain (Dem) will not participate. This "classic" debate formula will be used. It will be a one-and-a-half hour event. The moderator, or the media or student questioner, will address a question to a candidate and the candidate has a set time to respond. There will be one questioner from the media, at least one student questioner, and audience questions will be written on cards and handed to vetters, who will then hand them to the moderator to ask them of the candidates. There will be 1-minute statements of introduction by each candidate, and there will be 2-minute closing statements. Timekeepers from the League will be keeping time for the candidates and the moderator. The order of speaking will have been determined by a coin toss before the event. The Village of Millbrook Board of Trustees will hold a public hearing on an application for funding to the Community Development Block Grant to obtain ADA compliant restrooms at the Village Hall. The hearing will be on Tuesday, October 9, 2018 at 6:30 PM at the Village Hall located at 35 Merritt Ave. Millbrook, NY 12545. TAKE FURTHER NOTICE, that copies of the aforesaid proposed local law will be available for examination at the office of the Clerk of the Village of Millbrook, at the Village Hall, 35 Merritt Avenue, Millbrook, New York between the hours of 8:00 a.m. to 12:00 p.m. and then between 1:00 p.m. to 3:00 p.m. on all business days between the date of this notice and the date of the public hearing and at www.villageofmillbrookny.com/resolutions.html. TAKE FURTHER NOTICE, that all person interested, and citizens shall have an opportunity to be heard on said proposal at the time and place aforesaid. Please take notice that the Village of Millbrook Republican Committee will hold a caucus on September 18, 2018 at 7:00 pm to nominate candidates for the Village of Millbrook offices to be voted on at the General Election to be held on Tuesday, November 6, 2018 and to conduct any other business that may properly come before the caucus. All residents of the Village of Millbrook enrolled in the Republican Party are eligible to vote. Those not enrolled in the Republican Party are welcome to attend but may not vote. Please take notice that the Village of Millbrook Democratic Committee will hold a caucus on September 17, 2018 at 7:00 pm to nominate candidates for the Village of Millbrook offices to be voted on at the General Election to be held on Tuesday, November 6, 2018 and to conduct any other business that may properly come before the caucus. All residents of the Village of Millbrook enrolled in the Democratic Party are eligible to vote. The Village of Millbrook is looking for volunteers to sit on the Village of Millbrook's Comprehensive Plan Steering Committee. A Comprehensive Plan is an expression of a municipality's goals and recommended action to achieve those goals. It is an outline for orderly growth, providing continued guidance for decision-making. Millbrook's last plan dates back to 1985. The Village needs volunteers to help create and implement this new Plan. We are looking to recruit Village residents. The Planning Board meeting scheduled for Tuesday, September 18th has been CANCELLED. Please be advised that the Regular Monthly Meeting for the Village of Millbrook Board of Trustees scheduled for Tuesday, August 28, 2018 at 6:30 pm has been cancelled. The next Regular Monthly Meeting for the Village of Millbrook Board of Trustees is scheduled for Tuesday, September 11, 2018 at 6:30 pm. The Planning Board meeting scheduled for Tuesday, August 21st has been CANCELLED due to lack of agenda. On Monday, JULY 23rd (Rain Date Tuesday, July 24th) VRI will be replacing the FIRE HYDRANT on FOUNTAIN PLACE at the end of the road. In order to accomplish this work safely the water will need to be shut down for a period of time. The work is planned to be done between 9 am & 4 pm. The water shut down will be minimized as much as possible. After the work is completed the water may be dirty for a short period. Carnival runs from 7 PM to MIDNIGHT each night. Ride Wristbands will be available all 4 nights for $25 each. NO VEHICLES will be allowed down Franklin Avenue from the Village towards the Bennett Light after 4:30 PM. APPARATUS DRIVERS: you MUST enter the Village from the Bennett Light (82/343/Franklin Avenue intersection). MARCHERS: Please note that only apparatus appearing in the parade will be allowed from the Bennett Light into the Village on Franklin Avenue. It is advised that anyone else entering the Village after 4:30 PM use Church Street off of 343. The Planning Board meeting scheduled for Tuesday, July 17th has been RESCHEDULED to Tuesday, July 31st. The Village Hall will be closed the week of the 4th of July. We will reopen on Monday, July 9th. On Wednesday, JUNE 27th (Rain Date Thursday, June 28th) VRI will be replacing the FIRE HYDRANT on NORTH AVENUE at the intersection of FOUNTAIN PLACE. 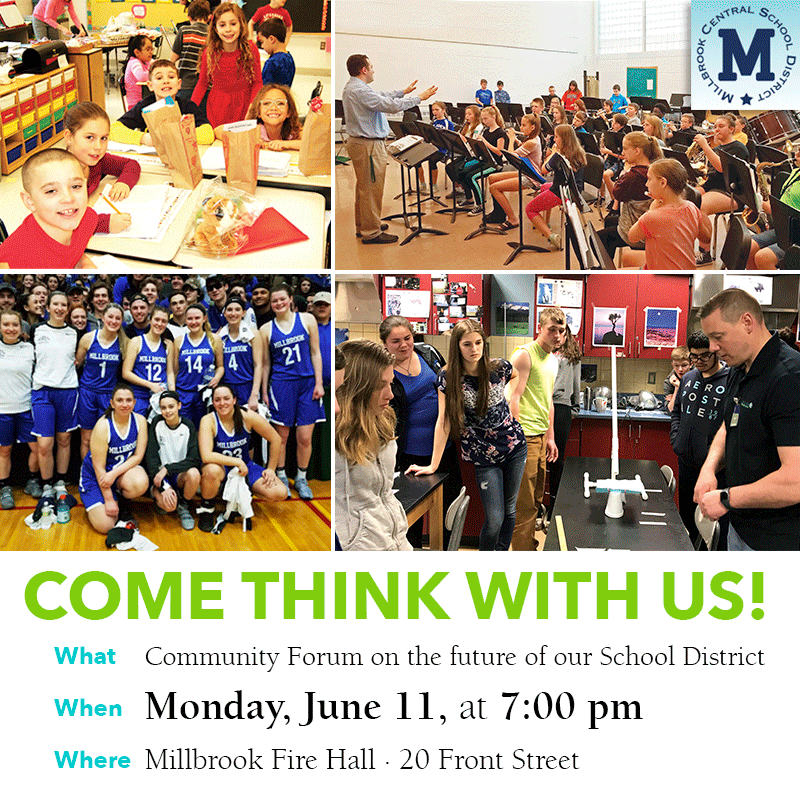 Please join us on Monday, June 11, 2018 at 7:00 pm at the Millbrook Firehouse for a community forum on the future of the Millbrook School District. Our school district has been undergoing a trend of declining enrollment and projections anticipate this decline will continue for years to come. ​The ​forum will provide all community members an understanding of the issue and an opportunity to voice their concerns, ideas and hopes. Your feedback is important to the Board of Education to assist us in making the most informed decisions possible for the future of our​ ​​students and our community. All residents are welcome. Please join us​​ Monday, June 11th at 7pm at the Millbrook Fire House. Improvement and upgrade of the water system-capital improvement plant. The Village of Millbrook will be flushing fire hydrants throughout the Village during the week of May 14th. Flushing is essential for pipe maintenance. It is common to experience turbidity (cloudy water) following the procedure. Run your faucets for a few moments to clear silt from your lines and check your washing machine and shower before using.